Release of the Draft Preferred Land Use Scenario in early September 2016 marks a major milestone toward the development of Plan Bay Area 2040. The Draft Preferred Scenario represents a regional pattern of household and employment growth by the year 2040, and includes a corresponding transportation investment strategy. In May 2016, MTC and ABAG released three alternative land use and transportation scenarios illustrating the effects that different housing, land use and transportation strategies would have on the regionally adopted performance targets. The three scenarios were featured in public open houses and online forums throughout May and June. They represent a progression of plausible regional futures, from more intense housing and employment growth in the urban core (“Big Cities Scenario”); to more evenly apportioned development among priority development areas (PDAs) in medium-sized cities with access to rail services (“Connected Neighborhoods Scenario”); to a more dispersed development pattern, with relatively more growth occurring outside of PDAs (“Main Streets Scenario”). Focusing development toward Priority Development Areas (PDAs) — neighborhoods served by public transit identified by local jurisdictions as being appropriate for smart, compact development. Preserving Priority Conservation Areas (PCAs) by confining growth to established communities, and protecting the Bay Area’s legacy of vast and varied open spaces. The Draft Preferred Scenario largely follows the regional growth pattern of Plan Bay Area, the region’s current long-range housing and transportation plan adopted in 2013. The Draft Preferred Scenario focuses 75 percent of new households and 52 percent of new jobs into PDAs, and distributes all remaining growth within the region’s planned urban growth boundaries/limit lines. Similar to Plan Bay Area, the Draft Preferred Scenario concentrates household growth in the cities of San Jose, San Francisco and Oakland, and along the east and west bayside corridors. In terms of employment, the Draft Preferred Scenario anticipates a modest shift from the growth pattern adopted in Plan Bay Area and incorporates substantial employment growth that has occurred since 2010. 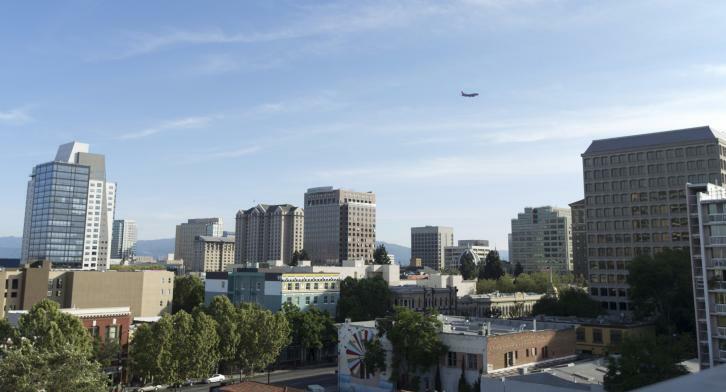 Since 2010, a significant amount of job growth has occurred in bayside communities (46 percent) and in the cities of San Jose, San Francisco and Oakland (37 percent) — areas comprising the preponderance of the region’s commercial space. The Draft Preferred Scenario job growth pattern echoes the current trend to continue over the plan horizon and encompasses a more rigorous analysis of potential employment growth by location. See the links in the tab below to review more detailed memorandums on the Draft Preferred Scenario. Similar to the alternative scenarios, the Draft Preferred Scenario was evaluated against the thirteen performance targets, as well as six associated equity measures, to identify strengths and shortcomings with this latest iteration. Each target and equity measure compares baseline conditions with future conditions to understand whether the region is expected to move in the right or wrong direction under a given scenario. The link to the memorandum on the right discusses preliminary results on the performance of the Draft Preferred Scenario. The target and equity measure results remain preliminary until finalized later this fall, when all scenarios will be consistently evaluated against the 2040 Plan horizon year as specified in the approved targets methodology. A programmatic Environmental Impact Report (EIR) will be prepared for PBA 2040, with the Final Preferred Scenario to serve as the basis for the California Environmental Quality Act (CEQA) “project.” This environmental assessment fulfills the requirements of the CEQA and is designed to inform decision-makers, responsible and trustee agencies, and Bay Area residents of the range of potential environmental impacts that could result from implementation of the proposed Plan. This EIR will also analyze a range of reasonable alternatives to the proposed project that could feasibly attain most of PBA 2040’s basic project objectives and would avoid or substantially lessen any of the significant environmental impacts. With the release of the Draft Preferred Scenario in early September 2016, attention turns to taking public comment on this milestone leading to the Draft Plan Bay Area 2040. Public comments on the Draft Preferred Scenario should be submitted by October 14 to MTC via email at info@bayareametro.gov, or via U.S. mail to MTC, 375 Beale Street, Suite 800, San Francisco, CA 94105. The Draft Preferred Scenario will be presented at several public meetings, including the Regional Advisory Working Group (RAWG), the MTC Planning and ABAG Administrative Committees, and the ABAG Executive Board. All input will be used to refine the preferred scenario before the MTC Commission and ABAG Executive Board are asked to adopt a final preferred scenario at a joint November 2016 meeting. All of this work, in turn, will form the foundation for Plan Bay Area 2040, slated for final adoption in 2017.